Have we passed peak SNP? With the SNP losing their majority, has the party reached its zenith? And what's happened to Tom Nairn's three dreams of Scottish Nationalism? It is classic early Nairn from which came the famous quotes ‘Scotland will be reborn the day the last minister is strangled with the last copy of the Sunday Post’ and ‘there is no Stalinist like a Scottish Stalinist’ – both of which contain poetry and over-statement. Beyond this, allowing for early Nairn’s doubts about the potential of Scottish independence, much of his critique has remained constant and stands the test of time. In the aftermath of Hamilton, Nairn was scathing of the bourgeois, respectable nationalism of the SNP, addressed the deep conservatism in society, the archaic nature of the British state, the ‘slow sleep’ of Englishness to use Orwell’s words, and the central role of the Labour party in maintaining the post-imperial show with all its puffery and magical hocus pocus, and its ultimate downfall. That’s an impressive hitlist, which only really missed the role of Europe in reshaping British politics, how it challenged the insular left, and its impact on Scottish nationalism – addressed by Nairn in ‘The Left against Europe’ published in 1972. Fast forward to more recent times – the SNP’s victories in 2007 and 2011 in Scottish Parliament elections – were watersheds for the party and country. In a sense they provided a foundational set of stories of Nationalist history and its journey through the years, from tiny group, to first, breakthrough, and then, triumph and ascendancy. It is nearly as impossible to overstate the sense of change that occurred in 2007 and 2011 – of Hamilton proportions and more – in that little was the same again. In 2007 a sizeable part of Scotland beyond the SNP willed the party to win and to end the miserable tale of mini-Labour rule with all its frustrations and fears. In 2011 a seemingly insurmountable Labour lead crumbled as election day approached and was replaced by an SNP landslide which took most of the country by surprise, but which felt like a release from the return of an unreformed Labour, a historic moment, and even, if a bit over the top, a sort of ‘Scottish spring’. On the way up in recent years – from say 2004 to 2011 – the party was shaped by a generousness, authenticity, outgoing character and desire to win people over as members and voters, and palpable hope. There was a tangible belief that momentum and history were behind the SNP’s sails, and that Labour, Tories and Lib Dems, and with it the appeal of the union in terminal decline. Such historical determinism with its Hegel for dummies is always dangerous, when people think the future is inherently theirs – leading to all sorts of over-reach and contempt for others. 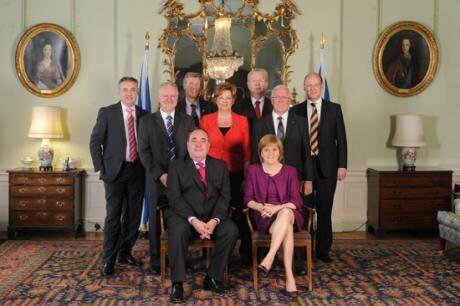 The SNP reacted humbly when first elected in 2007 – governing as a minority government, listening to others, yet acting like a national government in a way Labour had found impossible. There was, though, a degree of change when elected as a majority in 2011, but still much that many outside the party found to admire such as the competence of the SNP in office. Slowly if imperceptibly at first, majority government and the prospect of an indyref began to change the character of the SNP. It reinforced an iron discipline, top-down nature of the party, limited policy prospectus, and growing centralisation over public life. Some of these characteristics are understandable in the context of campaigning in an indyref, but while the democratic debate transformed the size of the SNP membership post-vote, this has not opened up or further democratised how the SNP does its politics. Sadly, the exact opposite has been the case. Take the triptych of Peak Nat – the indyref, 2015 UK election, and 2016 Scottish election – each of which represented a new level of SNP and pro-independence mobilisation. In each case in the aftermath, significant elements of the SNP reacted with a lack of generosity, absence of recognising the importance of pluralism and need to reach out to those who hadn’t been won over, and even an inability to accept the voters’ verdict. This last point is underlined by the fact that for all the SNP’s undoubted popularity, Nationalist Scotland has even at Peak SNP been a minority of the vote, while non-SNP Scotland has remained a majority. Briefly a few examples. The aftermath of the indyref saw both Alex Salmond and Nicola Sturgeon fail to speak to the nation, and understand the motivations of the 55% majority. Both in the immediate days after the indyref, continually spoke to and congratulated the 45% who lost – thus appearing as party leaders, not national leaders. To this day, no proper post-indyref post-mortem has occurred, analysing why No won, two million voters proved immune to the Yes case, and addressing how the contradictions and limitations of the 2014 indy offer can be transcended. Instead, what has been the dominant response has been a feeling of ‘we wiz robbed’, most consistently expressed by Alex Salmond, laying into the perfidy of the BBC, the Vow and Gordon Brown’s late interventions and promises. One doesn’t need to defend any of these factors, the BBC having by nearly every account a poor referendum, to recognise that this is displacement activity of not looking to your own shortcomings, and perpetuating a politics of grievance and grudge, which the SNP in the recent past of upward fortunes has done much to disassociate itself from (funnily enough, Alex Salmond being one of the leading believers pre-indyref in positive psychology and changing his ‘mindset’). Take the 2015 Westminster election and the SNP’s tartan tsunami where it won 56 out of 59 Scottish seats. This is Peak SNP when the party won 49.97% of the vote and 1,454,436 actual votes – both historic records for the party. This was a point where the SNP became in representation the national party of Scotland in a way none of its opponents ever had previously: Liberal, Tory or Labour. And that bore with it a responsibility to speak and act in a way which saw that the SNP wasn’t Scotland and Scotland not the SNP. Rather than this the tone was of Nationalist triumphalism, of talking of ‘the 56’ as speaking for Scotland, and of continually ridiculing the state of the other parties. There was the attempt to get the sole Lib Dem MP Alastair Carmichael thrown out of office, which had an understandable basis in his lying about leaking a Scotland Office document, but seemed to celebrate that one of Scotland’s three opposition representatives could be eliminated. At the same time, two newly elected SNP MPs, Michelle Thomson and Natalie McGarry, were accused of inappropriate behaviour, and suspended from the party. While the leadership acted quickly in both cases, the wider SNP and independence community, reacted by defending the pair and questioning anyone who dared to use the word ‘scandal’ about them. This takes us to the May 2016 Scottish election which saw the re-election of a third term SNP administration. Unlike 2011 this had already been pre-costed into expectations, with the SNP and wider Scotland all assuming that another SNP majority government was the most likely outcome. It was after all what all the polls were indicating – even though the room for margin was narrow, the electoral system isn’t meant to produce majorities, and this is the age of surprises from Trump to Bernie Sanders to Brexit not being dead in the water. "The SNP did well nine years into office, but fell victim to their own failure to manage expectations. Winning 46.5% of the constituency vote was a rise of 1.1% compared to 2011, but the party’s regional vote fell 2.3% to 41.7%, contributing to the party winning a mere four additional member MSPs (as opposed to 59 out of 73 FPTP seats), and overall falling from 69 to 63 MSPs, short of a majority by two seats. This is in many respects how the electoral system is meant to work, but came as a surprise to some of the more optimistic Nationalists. Worse Alex Salmond actually blamed the electoral system stating ‘I won a majority on 45% of the vote five years ago and Nicola did not win a majority on 47% of the vote, which is quite astonishing – remarkable’ (LBC, May 11th 2016). In fact, as former Deputy Leader of the SNP, Jim Sillars pointed out the 2011 majority was the freak result, producing a majority, whereas 2016 was the electoral system working as it had done previously and was consciously designed to do – producing a parliament of minorities. Then there was the dismissal of others and in particular the re-emergence of Tory Scotland under Ruth Davidson which saw them replace Labour as the main opposition to the SNP and poll 22.9% of the vote. All sorts of SNP senior figures such as Angus Robertson and Tommy Sheppard belittled the Tory revival – with many retweeting an image stating ‘So Ruth Davidson is less popular than Thatcher’. This missed that Thatcher’s three UK victories saw, for all her growing Scottish unpopularity, that in each the Tories were by a wide margin much more popular than the SNP. Add to this that the Tory vote was the highest in Scotland at any level since John Major won a surprise UK majority in 1992 and won 25.6% of the Scottish vote. That’s a generational shift and the beginning of the 1980s and the folklore of Thatcherism becoming part of history as it has to eventually, as opposed to the lived backdrop of everyday politics. This is in many respects what happens in most politics. A party on the way up is eager to win new friends and appear considerate. A party that has climbed to the peak of the mountain wants to retain its supremacy, regards large acres of the world as potential threats, and doesn’t take small or unexpected setbacks very well. This is the story of most politics the world over. This takes us back to Nairn’s ‘Three Dreams’. What are the motivating dreams of modern nationalism beside independence? There are three identifiable pillars: the destruction of ‘London Labour’, anti-Tory Scotland, and seeing the SNP as the embodiment of progressive, social democratic values. All of this makes independence appear contingent and a means to an end, but it isn’t that simple or clear-cut. One of the most unexplored elements of Nairn’s thesis was that of the role of ‘dreaming’ and Scotland as a ‘dream nation’ – a metaphor which regularly repeats in cultural setting but passes without much examination. A similar experience occurred in 2014 when I published ‘Caledonian Dreaming’. The title was meant to act as an invitation and provocation: of the Scottish propensity to the abstract and utopian imagination, and the oft found chasm between action and rhetoric, and how there was a causal relationship between the two: the pull of the sweeping, gesture politics of principle, while ignoring detail and incremental change, and the appeal of grandiose language and tribunes. None of this was noted in any of the reviews or comment on the book, apart from one English based academic. Moreover, this dynamic has contributed to Scotland’s radical tradition for most of the 20th century remaining on the margins with isolated exception (UCS, poll tax non-payment), and played a major role in the triumph of a politics of administration and managerialism, irrespective of the party in power. That this has passed without scrutiny does seem surprising. Dreaming in Nairn’s Scotland had several dimensions: visualisation, mobilisation, argument, collective possibilities, identifying positive and negative dreams, and contested Scotlands. Yet, there is a binary quality to Nairn’s dreamland: of good and bad dreaming, as well as an absence of any comment on its connection to disjunctures in public life: itself a recurring theme throughout Nairn’s life project of work on Scotland. Where are we today in comparison to Nairn’s 1968 perspective? In many respects, the landscape is completely different, but in many others, starkly familiar. Nairn wrote then of the absence of ‘the great dreams of May 1968’ and the hopes of the Sorbonne, Prague, Warsaw and Berkeley and the prospect of Dundee, Linwood and even St. Andrews being sites of revolutionary hopes. But while much of the new left flattered to deceive, our politics cannot be reduced to bank managerial safety-first nationalism versus a similar version of unionism. The limits of dreaming should be obvious. A different approach would look at some more practical and concrete steps such as how we keep a check on power; preventing concentrations of influence and wealth; preventing an insider class from becoming too omnipotent, and creating a public sphere which allows for proper policy discussions and intellectual exchange. Much of this is within the framework of the critique Nairn built up in the years after ‘Three Dreams’, particularly his classic ‘The Break-up of Britain’, first published in 1977 – a suitably subversive counterblast to the Queen’s Silver Jubilee. A Scotland of wholeness, of the allure of redemption and being saved, is unrealisable and unattractive – a place which stigmatises the past and present too much, in favour of an abstract, unattainable future. It entails us being too hard on part of ourselves – as if we need to purge our inner thoughts and desires to be cleansed and liberated – in the sort of re-education process a younger Nairn would have called Scottish PolPotism. Scotland has a bigger, more confident bourgeois nationalism today than fifty years previous. The SNP are the new in-crowd and no longer new kids on the block. They have contributed immensely to the politics and public life of our country in that period. But they are, perhaps even more than any other Scottish party, a product and reflection of the characteristics of our society, warts, flaws and positives, and how could it be otherwise. The SNP have taken us far. We always knew that nationalism – whether Scottish or British wasn’t going to be enough. Social democracy, that oft cited description of our politics, is on its knees across Europe, and we haven’t solved the modern dilemmas which impale others. The new left of the 1968 generation never lived up to its hype, while neo-liberalism, despite never being openly advocated in Scotland, has influenced all the mainstream parties, but is now widely discredited and associated with zombie capitalism. This leaves radical democrats, egalitarians and those from the left tradition, knowing that we have to invent a new political tradition. That isn’t something the SNP or Scotland can do on its own, but we can play a small part in, if we recognise the failings of the political traditions which have defined us. Scotland’s future will look very different from today and that is something we should welcome and embrace. This isn’t a clarion call to ‘work as if you live in the early days of a better nation’ which always sounded very Scottish, purposeful, and possibly orchestrated with an element of coercion. Instead, let’s ‘act as if’ we already are independent – which necessitates seriousness, radicalism, play, irreverence and standing up to groupthink and orthodoxies – wherever they come from – the SNP included.